radley Wiggins wins the Tour de Romandie 2012 and is the first British citizen to win in the entire tour history. The Tour de Romandie is a cycling race in the Swiss-French cantons of Western Switzerland made up of multiple stages which are different year-to-year. This years tour consisted of a Prologue and 5 stages. This year, the first three stages were relatively flat followed by a steep mountain stage and finished with a short climb time-trial stage in Crans-Montana. The tours total distance was 695.1 km and included 8793 meters of ascent. For 2012, the Tour de Romandie was scheduled half way through the annual UCI World tour calendar (14th in the calendar of 28 events), the Tour de Romandie falls just two months prior to the famous Tour de France. 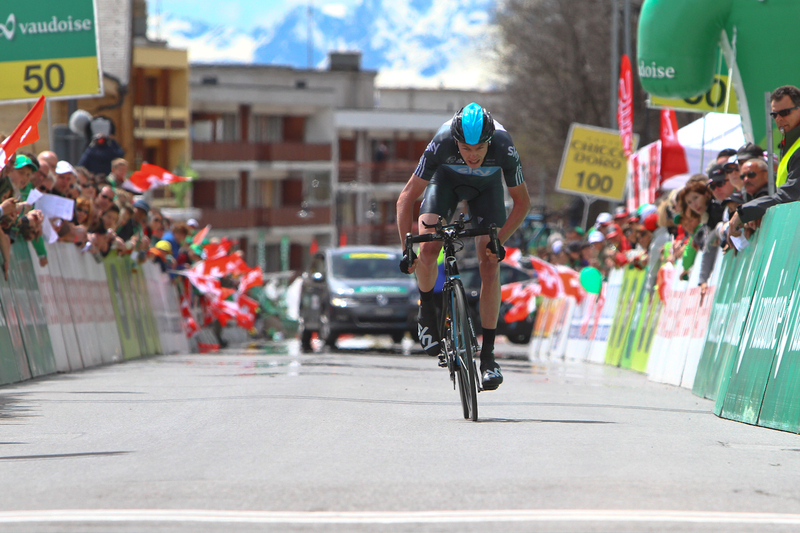 Bradley Wiggins (team Sky) took the victory in the first road stage of the Tour of Romandie, between Morges and la Chaux-de-Fonds. The British cyclist sprinted away from the peloton after the 184.5 km stage. Team sky appeared in control for a majority of the stage. Jonathan Hivert (Saur-Sojasun) was the winner of stage two of the Tour de Romandie from Montbéliard to Moutier. The Frenchman beat Rui Costa (Movistar) and Luis León Sánchez (Rabobank) in an uphill finish. Luis Leon Sanchez (Rabobank) took the win on Stage 3, beating a group of strong contenders into Charmey. The Spaniard secured a ten second time bonus to move to within one second of race leader Bradley Wiggins (Sky), who was unable to respond in the uphill sprint for the line. Stage four was a second straight victory for Luis León Sánchez (Rabobank), in the fourth and most difficult stage of the Tour de Romandie between Bulle and Sion. The spanish rider took the yellow jersey. Sánchez was fastest of the tired peloton after the difficult climbs in the surrounding mountains. Sánchez took the lead as it entered the final straight and holding on to take the victory. The final stage held in the scenic ski resort town of Crans-Montana where riders faced very strong winds and a relatively short but steep ascent in an individual race against the clock. Bradley Wiggins won the 5th and final time trial stage the 2012 Tour de Romandie to take the overall Tour victory. Wiggins (team Sky) clocked the fastest time on the very windy mountain climb of 16.5 km finishing 1min-23sec faster than the stage-4 leader Luis Leon Sanchez (Rabobank). American Andrew Talansky (Garmin-Barracuda) finished second in the final stage to earn best young rider classification and second place overall. Wiggins’ Sky team-mate Richie Porte placed third. Sanchez who had wins in stage-3 and 4 dropped to finish 10th overall after the grueling final tour time-trial stage. Team Sky rode well as a team in the Tour-de-Romandie and appears to be a force to be reckoned with in the upcoming Tour-de-France. I look forward to following this team closely in particular as they performed strong as a group. As a member of the official press, I got an inside view of how the Tour-de-Romandie was orchestrated. Logistical efforts including regulating road traffic during the tour, managing media access and press accomodations, public communciations, coordinating safety and security, and providing live television coverage from both land and air (helicopter). It proved impressive to experience and this tour was exceptionally well planned and executed. IPA Staff ID: 06694 • Daniel Mitchell is a Freelance Professional photographer with a focus on athletics and sports photography. Based in Vevey, Switzerland - Daniel`s agenda includes frequent International travel in pursuit of sports and event images. As a compliment to his photography work, Daniel uses his images and video clips to assist enterprises promote themselves visually with social media advertizing. Daniel maintains several facebook pages and websites for various organizations.